Other fun items we are adding to the package are stay bright cupcake liners, a cupcake scented candle in a cupcake tin, and cute cupcake plates! 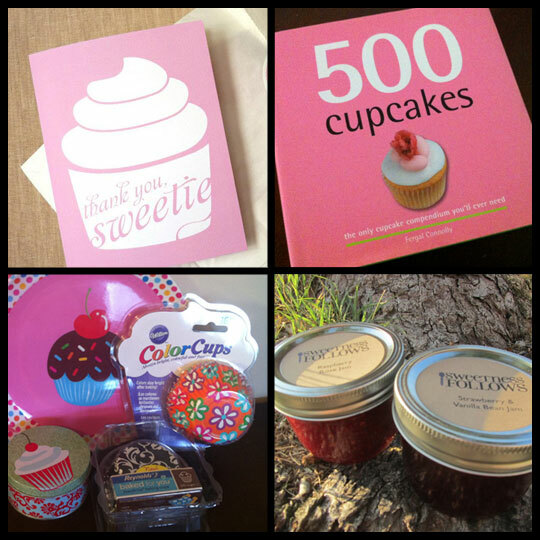 This entry was posted in Cupcakes and tagged contest, cook book, Cupcake, cupcake liners, giveaway, jam, thank you cards by Stacy. Bookmark the permalink. My favorite cupcake shop is Simply Sweet cupcakes in Snohomish, Washington! I like Fresh Bakery in Owings Mills. They have really good cupcakes, although their customer service lacks at times. My favorite Cupcake shop by far is icedgems in reisterstown, Maryland!!! Hard decision to make, I give the edge to Baked & Wired, but I do buy Georgetown Cupcake when I want inspiration for a new flavor. i don’t have twitter but I’ve liked this page and follow on pinterest omw to foursquare to follow you now…. Glad I follow you on Facebook, Foursquare, and Pintrest already. And of course get your blog posts and emails. SUPER congratulations to you!!!! Love reading about all your yummy adventures. My favorite cupcake shop is probably Baked by Melissa here in NYC – bite sized and so many flavors! My favorite cupcake shop is Kupcakes & Co in Elkridge! I love to follow you on Facebook, I’m always left craving a cupcake 🙂 Congrats on an amazing year of blogging! My favorite cupcake place is Danielle’s Sweets in Tyson’s Corner and the Alexandria Cake Pop Company! Follow you on FB and twitter. Love the peach cobbler cupcake at Kupcakes & Co. Visited there based on your recommendation! Follow your blog as well. I don’t have a favorite cupcake shop! I like you on facebook and pinterest! I follow you on Facebook. My favorite cupcake shops are Icedgems in Reisterstown, MD (I love the cupcake truck!) and, closer to my home, Sweet Devotion Cupcakery in Havre de Grace, MD (which now has “Sweetie”, a cupcake/ice cream truck that visits local neighborhoods in the evenings). Kupcakes & Co in Elkridge is pretty good! We get them all the time. I did it all either under my name or esornire. 🙂 I actually was already following you guys everywhere but 4square and blog alerts. I’m following you on Twitter, FB, and Pinterest! I like Kupcake & Co (Elkridge) not only because they’re tasty, but the Pay It Forward Friday. My favorite Cupcakery is FLAVOR Cupcakes in Bel Air, MD!! I’m being seriously deprived too because I am 1500 miles away in Fort Sill, OK due to the Army. I follow you on Facebook. My favorite cupcakery is Flavor in Bel Air and Cockeysville, MD! We don’t have any cupcake bakeries up here in nothern mn, but I follow u on facebook and pinterest and I made ur yummy 7-up cupcakes!! Love to bake!! I love your blog! I love everything about you!! I’m getting married in 27 days and I’m having a Cupcake Wedding cake provide by Maggie’s pastry in North Hollywood! I am a cupcake lovin’ girl and the only thing that makes me swoon in the edible cakey world is, an awesome cupcake! My favorite cupcake shop is Scratch–opening next month in Lancaster County, PA! (http://www.scratchbakes.com) The owner is my cousin, and I’ve had the privilege of tasting her stuff even before her shop has opened! I follow on Facebook. And Clara and I will join you at the Baltimore City cupcake picnic with homemade goods in hand! I am already a fb fan and love you guys! Hope to meet you soon! I haven’t been to all of the cupcake shops in Nova, dc an md yet. But I do like to visit Blondie’s and Sweet Sue’s Bake Shop in North Beach, Md. Check them out if you haven’t already. Blondies was on Cupcake Wars. My favorite is Starry Night Bakery is Westminster. And I follow you guys on Facebook! Favorite cupcake shop is Sugar Mountain Bake Shop in Rochester, NY! I only have been there once, but I’ve been aching to go back ever since. I truly LOVE Georgetown Cupcakes in DC and Vanilla Pastry Studio in my hometown of Pittsburgh, Pa! I love everything cupcake! I follow you on Facebook, Twitter, Foursquare and Pinterest. My favorite cupcake shop is Gigi’s in Flowood, MS!